As we’re about to enter 2018’s fourth quarter, IFA 2018 is upon us. One device that’s expected to launch at the event is Sony’s Xperia XZ3. The device will succeed the Xperia XZ2 launched earlier this year and will likely launch its successor with a handful of upgrades. The Xperia lineup, once discontinued by US carriers had a fresh start last year, as Sony focused on the Xperia XZ and the Xperia XZ Premium. At the time of their launch, the latter appeared well poised to take on the likes of Samsung’s Galaxy lineup, but a few factors prevented this from happening. Now, we’ve got more information for what just might be the Sony Xperia XZ. Take a look below for more details. Sony’s known for its mechanical designs, often choosing to give its products a sober, industrial design-like feel. The Xperia XZ lineup is no different, however, the Japanese company does include color options such as gold which somewhat deviate from the rigid design themes. The Sony Xperia XZ Premium and the Xperia XZ2 Premium vary in this approach, with the XZ2 featuring rounded corners and thinner bezels; making for a more friendly look. Now, as we look forward to the Xperia XZ3, Sony will gradually start to inculcate modern design principles into its upcoming mobile gadgets. By modern, we don’t mean a notch, just to be clear. 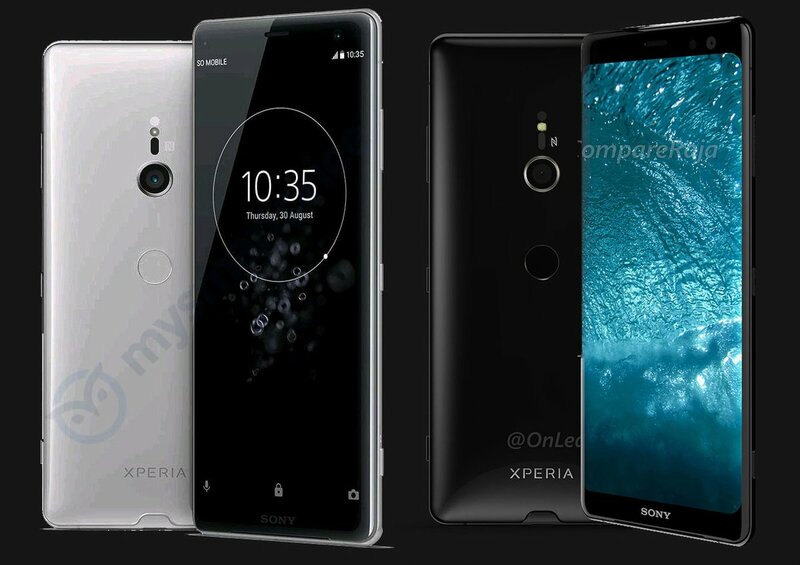 The Xperia XZ3 will feature a sleek form fact and leaked renders suggest particularly thin vertical edges that seemingly hint at a curved display. Interestingly, the Xperia XZ3 also features a single-rear camera sensor, in stark opposition to the commonly accepted practice in the flagship smartphone world. Sony’s looking to pull off a Google and the company’s hardware prowess with camera sensors does back up such a risk. However, if you’re hoping that Sony’s monstrous 48MP camera module will make it on the XZ3, don’t; the Snapdragon 845 simply doesn’t support such a high pixel input. 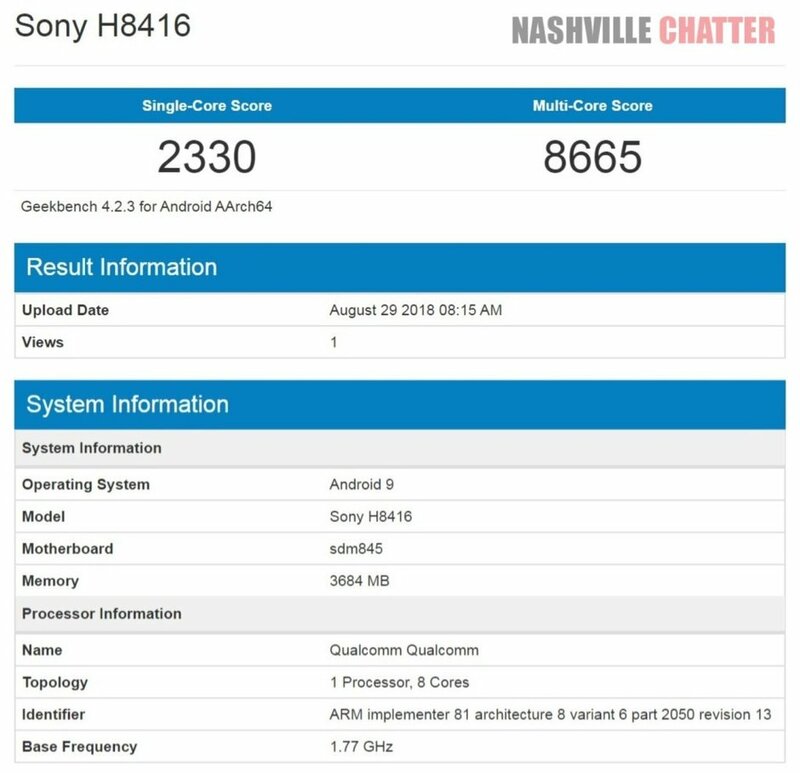 Speaking of which, take a look at the Xperia XZ3’s GeekBench screenshot below. Well, we’ve got an alleged benchmark for the Xperia XZ3 today that promises the Snapdragon 845 and approximately 4GB RAM for the smartphone. Shared by NashvilleChatterClass, as the highly visible logo on the image’s top-right shows, the listing is not available on GeekBench’s database. Which is interesting since the date of testing is 29th August, and unless the test was carried out in Austrailia, that just gives it a few hours of life. Additionally, the operating system for Sony’s H8416 is listed as Android 9. GeekBench generally lists sub-update numbers as well, that often result in at least additional two decimal points (for example Android 8.0.0). This image doesn’t show Android 9’s complete reference number, which subsequently adds for another red flag for its reliability. If Sony launches the Xperia XZ3 with Qualcomm’s Snapdragon 845, the device will effectively be a mid-ranger after six to seven months. The only other upcoming smartphones that are rumored (or pretty much confirmed, have your pick) with the processor are Google’s Pixel 3 and Pixel 3 XL. The choice of a single rear camera and a sleek design will prove as the XZ3’s definitive features. Let’s hope Sony’s got its camera game on par as well. Thoughts? Let us know what you think in the comments section below and stay tuned. We’ll keep you updated on the latest. Update: It isn’t fake. We apologize but you really can’t be too careful these days.